And then I grew up and she told me how to make it. To say that I was SHOCKED would be a great understatement indeed. Do you want to know how my granny makes the tastiest and EASIEST raspberry and strawberry jam ever?! Be prepared to be pleasantly surprised, and be prepared to deal with the amazement of your friends and family when you make it yourself and they start thinking of YOU as a domestic goddess as well! 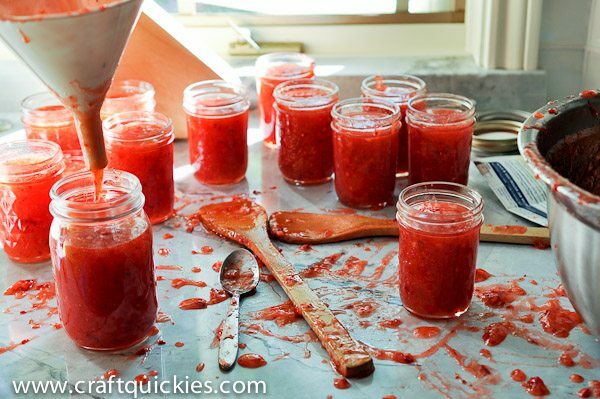 So what is the secret to easy homemade strawberry jam? Pectin. A specific brand of pectin, to be exact. Sure-Jell pectin. My grandma says that the Sure-Jell MCP pectin is the ultimate best, but we have a tough time finding it in Colorado for some reason, so I use the traditional Sure-Jell pectin IN THE YELLOW BOX. They taste the same to me, but I do trust my granny’s tastebuds over my own on this matter. 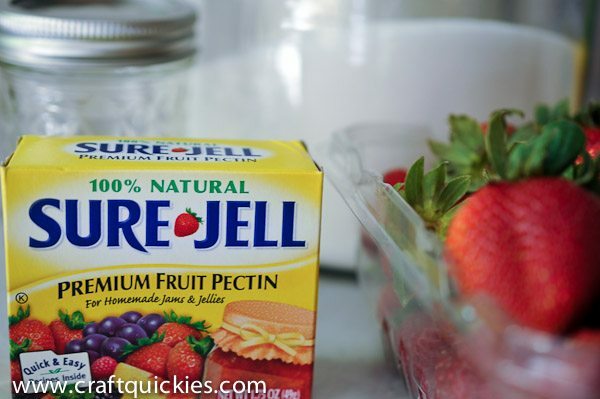 Once you get your hot little hands on the YELLOW box of Sure-Jell pectin all you have to do it follow the Quick & Easy Freezer Jam recipe. NOT the cooked recipe! Simplify your life!! Let me walk you through it. I am not including exact measurements, because they are all included in the instructions on the box, and they are different for each type of fruit. Gather your pectin, fruit, sugar, and jam jars. Yes, that is it! I used strawberries. Strawberry jam is my favorite! 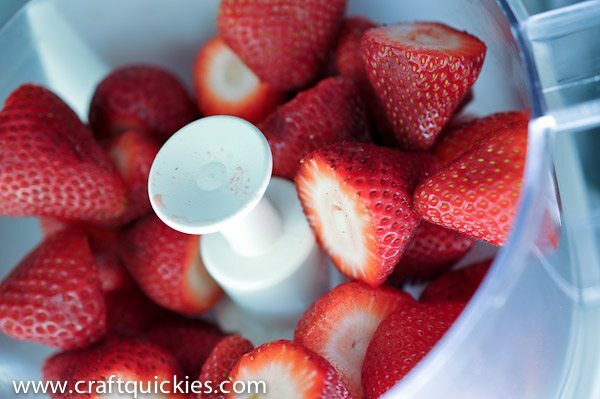 Cut the tops off of your strawberries and throw them into a food processor. 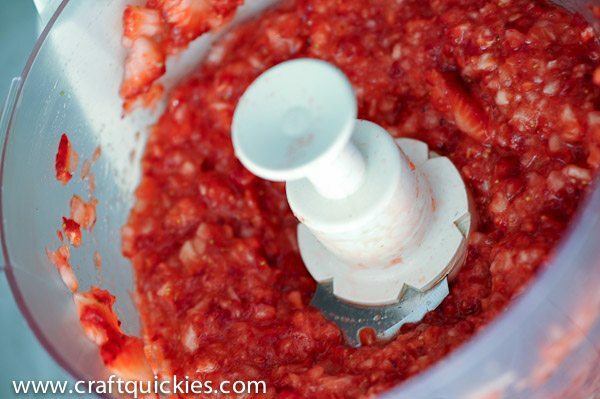 Pulse the food processor to mash up the strawberries. Do not puree completely! You can also do this with a potato masher. Granny does, but I am lazy. Measure your fruit mush (the fancy technical term, obviously) to make sure it is the correct amount. Be exact with ALL of your measurements! Pour it into a large bowl and add the sugar. It is a LOT of sugar. Prepare yourself. But that is what makes it oh-so-GOOD! Stir the sugar and fruit mush together very thoroughly. Let sit for about ten minutes. 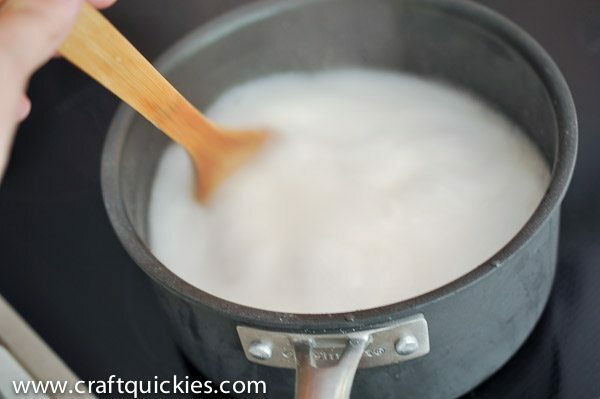 While the fruit and sugar are stewing, follow the directions to prep the pectin on the stove. 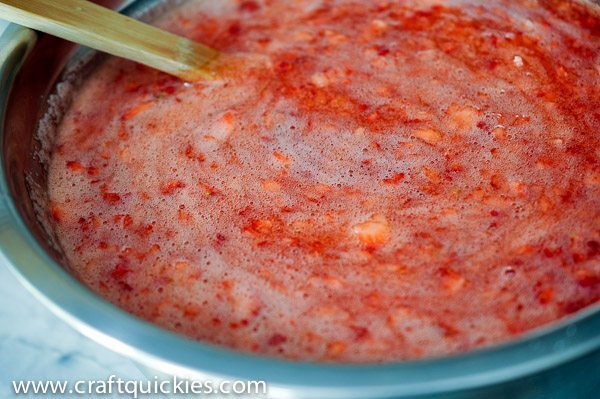 You will combine the pectin with a small amount of water and stir it constantly over heat until it is dissolved. It starts rather clumpy, as you can see. Stir the pectin mixture into the fruit and sugar mixture. Stir until it is no longer grainy. Now you are done! Seriously. Crazy, right?! Time to pour! 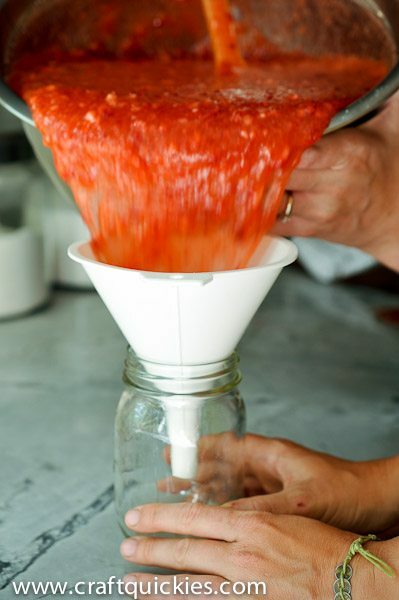 Use a funnel or a bowl with a spout to pour the jam into jars. Leave a bit of space at the top for sealing purposes. This part is a lot easier if you have someone to help you with an extra set of hands. I also think it would be easier if you had a bowl with a spout right on it. I’m going to buy one prior to my jam-making day next year! As you can see, we made a wee bit of a mess….. Maybe I won’t try to quadruple my recipe all at once next time! Sheesh! Close your jars and let them sit at room temperature for 24 hours to set. 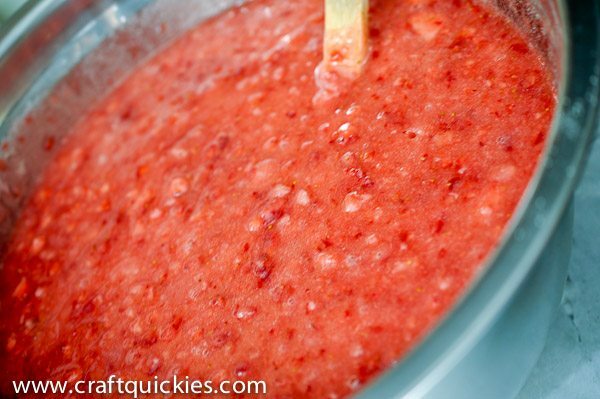 After 24 hours place jam in the fridge or freezer. I freeze all but one of my jars and use them all year long! YUM!!! So easy, and totally worth the bit of extra effort to have homemade jam on hand! 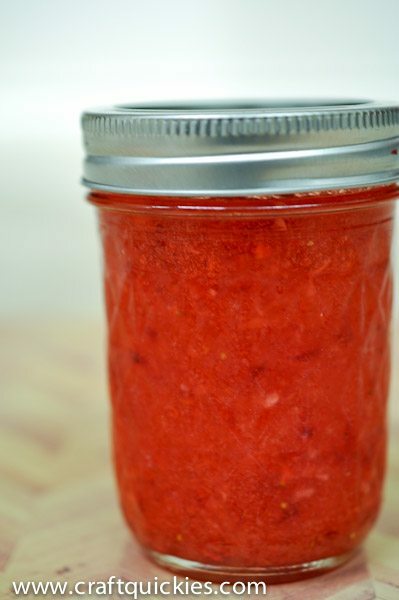 Right now it is strawberry season, which is the perfect time to get jam making! 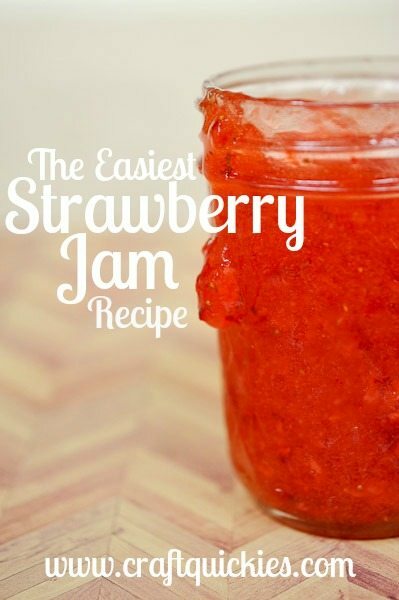 The Easiest Strawberry Jam Recipe Ever! Mash the fruit with a potato masher or by pulsing in a food processor. Measure the fruit and sugar amounts exactly and stir together. Let sit for 10 minutes. 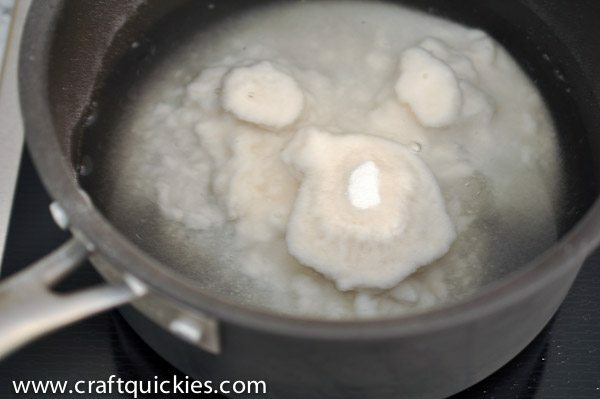 Dissolve pectin in water over heat. Pour the pectin mixture into the fruit mixture. Stir until it is no longer grainy. Pour into jars. Leave some space free at the top of each jar. Let jam sit at room temperature for 24 hours to set. After 24 hours place jam in the refrigerator or freezer. « A Fourth of July Craft-Off! Oh baby. That stuff is like candy! Maybe I will actually make some this year – I have never tried it. Do it while the strawberries are cheap, girl!! It is so easy!! How long does the jam keep without keeping it in the freezer? I want to make some as gifts but want to be able to put an expiration date or freeze by date on it. I’m so excited to make this recipe but I’m wondering how many jars it will make and what size these jars are? How many strawberries are recommended? 1 quart strawberries which is 2 16oz containers and the same recipe is in the box of sure jell pectin, and says makes 5 8oz jars but goodness no! I got 7 of them! Mine is setting now on counter til tomorrow evening! Praying it sets! Hope yours turns out as well 😉 and hope my info helped too! I always get more too, actually! Thanks for the tips! do you sterilize the jars ? do they need to be special jars for the freezer? I collect jars through the year (empty pickle jars, etc) and use them, so they really aren’t anything special. Found this really cool way to core strawberries……I used a straw from Starbucks and cut it in 1/2 and my daughter used a plastic straw from her drink cup. You place the straw on the bottom of the strawberry and put it up through the stem. 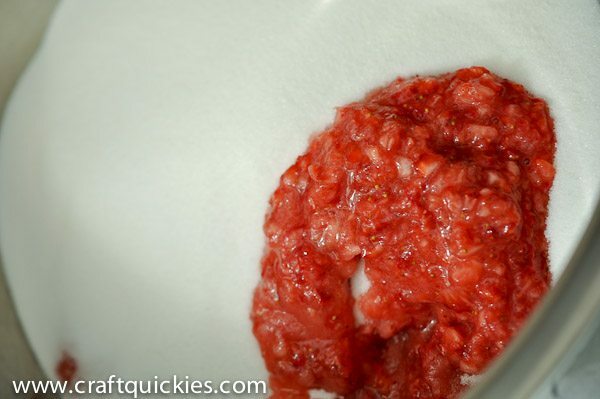 This takes the core out and wastes less of the strawberry and is quick too! My daughter and I did 12 cartons of strawberries in 25 or so minutes. Thanks for sharing on Sunday’s Best. Strawberry season is around the corner, and I’m thinking about making strawberry and blackberry jam. Your recipe looks easy enough. Yum! That looks delicious (and strawberry jam is my favorite too). Thanks so much for linking up with #ShareTheWealthSunday! awesome!! 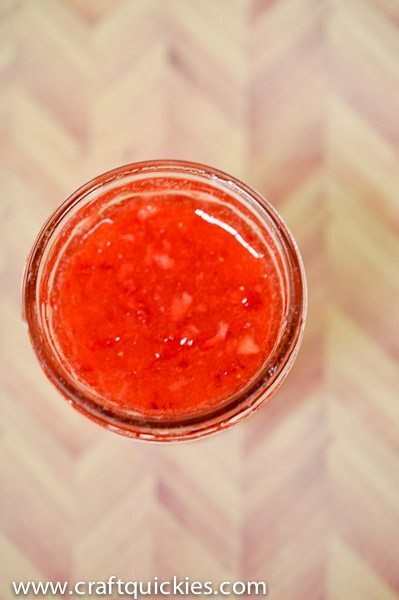 I will have to admit I tried twice to make strawberry jam (my fav) and failed both times – the first time I was following the recipe but scared of it so wouldn’t let it get to a hard boil (realized in hind site) so stirred and stirred forever ending in a nice strawberry syrup. The second time I guess I did the sure jell wrong as I had a lumpy syrup lol. This sounds and looks AWESOME! and will be the recipe I use next. Thanks for sharing with Snickerdoodle Sunday! Looks so yummy, but all that sugar! At least you know exactly what’s in it as opposed to store-bought. Thanks for sharing at Thursday Favorite Things! It’s true . . . it’s not health food. Haha! This is how my mom makes it too! Thank you for linking up to the Bloggers Brags Pinterest Party. I am finally getting around to pinning your post to the Bloggers Brags Pinterest Board. I’m new to this whole process. Do I have to sterilize containers? Thank you for this get post,, this strawberry jam is so good. Have made it may times before. I have also used the sure jell cooked method when I didn’t have freezer space but work great for many types of fruit. I even tried a red tomato jelly but the family wasn’t keen on that favor. As for making the a mess when filling jars. There is a canning jar funnel that sits right on the jar and won’t tip. It is wonderful helper. Also try not pouring but use a soup ladle, that works best for me and no mess. I love to make jam. This looks amazing. Thank you for sharing at What’d You Do This Weekend? Hope to see you back next week! It seems so easy to make these. I don’t know why I’ve never tried it myself! Maybe I’ll finally give it a try this year. 🙂 Stopping by from the This is How We Roll link up.